Cat treat options are almost as limitless as available dog treats and these treats are as great for bonding and training purposes with cats as they are in dogs. The basic principles of selecting treats that include: few ingredients, the reputation of being top quality brands, those manufactured in the USA, and containing only high-quality ingredients, should dictate your choices when looking for good cat treats. Treats are useful with cats and kittens for many purposes including training, rewards for good behavior, easier pill administration and overall general enrichment. Be careful, however, not to give your cat or kitten too many treats because the extra calories will add up very quickly. Cat treats are delicious, but not especially nutritious, so it is important that most of your cat’s calorie intake is derived from a balanced cat food. Use treats just for training, bonding and reward purposes. 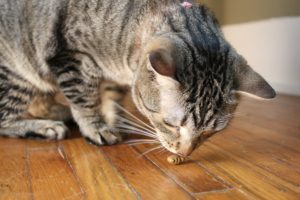 The treats discussed in this article are generally safe and appropriate for most pets’ gastrointestinal tracts but please be advised that these are general guidelines and may not be appropriate for all cats, especially those with sensitive stomachs, health concerns or food allergies. Don’t forget that new treats should always be introduced gradually under your direct supervision to be certain that your cat tolerates them well. For ease of discussion, we will break our advice about cat treats into the following categories: soft treats, crunchy treats, dental treats, home cooked treats, enrichment treats and supplement treats. Soft treats are generally small and squishy and are usually very well-received by most cats. They make a great reward for nail trimming and other training purposes. Some of our favorite soft cat treats include Orijen Freeze-Dried, Life Essentials Freeze-Dried and Vital Essentials Freeze-Dried cat treats. As with dogs, Greenies Pill Pockets are pocket shaped soft treats that are very helpful in administering oral medications in many cats. Crunchy treats are another great reward choice for many cats. Some of our favorite crunchy cat treats are Wellness Kittles treats and Purina Pro Plan Crunchy Bites Cat Snacks. Dental treats are crunchy style treats that can be a helpful complement to regular teeth brushing and veterinary care. In order for cat dental treats to work, it is essential that your cat chews the treat; if your cat swallows dental treats whole, this won’t improve dental health. If your cat doesn’t chew dental treats, we suggest speaking with your veterinarian about other options. Feline Greenies Dental Treats are a great dental treat option. Home cooked treats may also be appropriate for cats and there are lots of great recipe ideas on the internet for both soft and crunchy treats cooked at home. It is easy to bake soft treats which can be stored in the refrigerator by using foods such as chicken or salmon. Bake the meat until fully cooked and cut into small pieces for a delicious treat. Enrichment cat treats are usually longer lasting and provide more mental stimulation for your cat. Catnip is a favorite old standby. Catnip is entirely safe for both cats and kittens to roll on, play with and even to eat. Don’t worry! Catnip is absolutely not addictive. Buying and even cultivating fresh catnip plants and cat grass can provide lots of fun for your pet but, on occasion these have been known to cause some mild gastrointestinal upset in certain cats so be sure to introduce these very slowly. Inaba makes very interesting treat options for cats, including tuna and chicken Grilled Fillets which are small, individually packaged cuts of tender meat. Inaba tuna and chicken Churu Purees are lick-able creamy treats that have an interesting appeal to cats as well. Supplement treats is our final category of feline treats for you to consider; these are generally similar to soft cat treats with an added punch of including supplemental ingredients aimed at improving your cat’s overall health. VetriScience and Pet Naturals of Vermont are good manufacturers of various supplement treats. Treats with the addition of Lysine (specifically Vetri Lysine Plus or Pet Naturals L-Lysine), provide good immune support to cats with a mildly weakened immune system. These can also be helpful in trying to prevent repeat flare ups of mild chronic infections including upper respiratory tract infections. Certain treats are aimed at reducing stress or anxiety in cats; these treats contain natural calming ingredients, including L-Theanine, which is a calming amino acid that is also found in green tea. VetriScience Composure and Pet Naturals Calming are treats that may help calm your anxious cat. Please note that the supplements described here are not intended to be a replacement for veterinary attention and you should always contact your veterinarian if you have health concerns about your cat, but these can be a useful adjunct to good veterinary care. The treats described above are just a small sampling of the many great treat options available for cats. There are many alternative high-quality treats available in the marketplace for you to try. The suggestions contained herein are some that are favored by veterinarians, pet owners and our furry taste testers with sensitive stomachs. To learn more about ViaGen Pets and the services we offer, please visit our website at www.ViaGenPets.com or call us at 888-876-6104.